Recently I rewatched the original Godzilla film a couple of times. Once with my kids, where I had to read out the subtitles to them, and the other after I’d listened to the Godzilla episode of the Skiffy and Fanty Show. The podcast gave me a fresh appreciation for various aspects of the film including various influences of Japanese culture and history of which I was previously unaware. So I think it meant that on the most recent rewatch I was simply more aware of everything than I had been previously, picking up on elements and aspects of the film that I hadn’t spotted on other viewings. I doubt there’s anything new here for the many kaiju fans who of course have a much better understanding and appreciation of the film than myself, but for the more casual viewer, you might find some of this of interest. Out of necessity, there are major spoilers about most of the important beats of the film within this article, so if you haven’t seen Godzilla, you may wish to watch it first so you can get its full effect without knowing all the surprises. It certainly feels a lot more like a disaster film than a monster movie. There’s no humour or lightness to it – it’s a dire situation that is played completely straight – and the human cost is never played down. All this makes sense, given that for the Japanese Godzilla is a personification of atomic destruction, something they experienced the horror of first-hand less than a decade before. Unlike the makers of so many disaster films, these people had actually experienced this kind of annihilation. 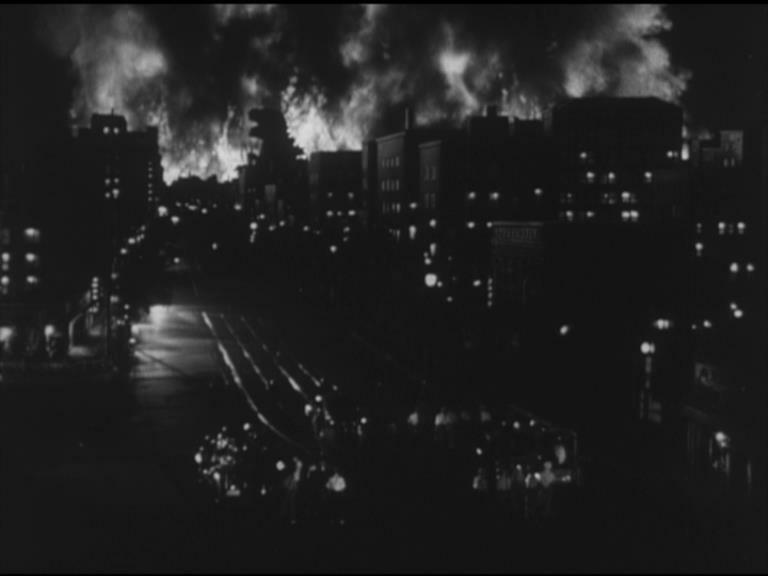 One of the things I’d never noticed on previous viewings was a brief moment in a brief shot – Godzilla silhouetted in the flames up near the top of the screen. After Godzilla’s major attack on Tokyo, we’re actually given a period of mourning within the film. Not the brief moment of reflection before moving on that many films do, this is extended and painful. We get to see first hand the effects on the population, their grief and helplessness in the face of such an incredible force of destruction. Even when Godzilla is beaten at the end, and we’ve had the reporters cheering the victory, the movie dwells on the three remaining leads who are all utterly devastated. The personal cost to them has been huge, and they have nothing to celebrate. And Tokyo is virtually gone. 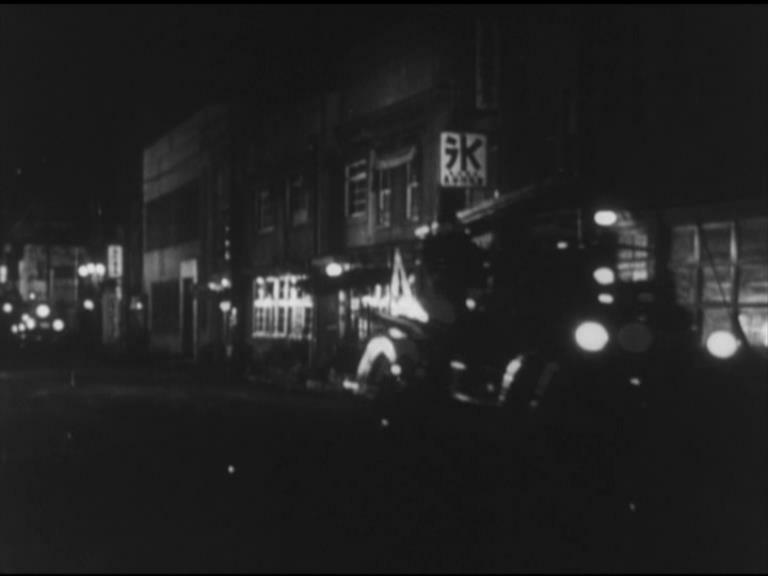 In fact, it’s still a ruin in the following film, Godzilla Raids Again. The direction and editing on the film are solid, as are the performances. To modern audience eyes some of the effects may seem a little weak, but they do the job they are meant to do – they tell the story of what is happening. In fact, I think most of the effects sequences hold up precisely because of this. They aren’t there to look flashy, they’re there to tell the story. The effects also hold up because of intelligent decisions on their use. In one sequence we see some fire engines get wrecked. Almost every shot of the vehicles is a model shot, meaning there’s no need for the audience to suspend disbelief from one shot to the next. If the crew had used a mix of real and model engines, swapping back and forth several times, there’s always that momentary dissonance for the viewer as we adjust to each change. By using models for all but shots where we need to see a human reacting, the film-makers avoided that issue. They used whatever effect best told the story. Model shots, animation, mattes, rear-projection, hand puppets, even some super-brief stop-motion animation of Godzilla’s tail. When the electrical towers get melted the effect is stunningly good – those models were actually made of wax. There’s a lot modern film-makers could learn from the effects choices in this movie. Let’s finish by looking at the characters. Dr. Kyohei Yamane is a palaeontologist who doesn’t want Godzilla killed. This isn’t simply because Godzilla hails from Earth’s ancient history, though that would be reason enough. He also believes that studying how the creature has survived such high levels of radiation could be beneficial to mankind. He’s a great character, well-rounded and thoughtful in his approach. He hates that everyone wants Godzilla dead. He’s not wilfully blind to the damage and loss of life, he’s trying to look at the bigger picture for the future of mankind and how we may need to find ways of surviving radiation ourselves. Emiko Yamane, Kyohei’s daughter, gets a reasonable amount to do, character-wise, even though she’s at the centre of a love triangle. Certainly her decision to keep her promise to her fiancé and not reveal her knowledge of the Oxygen Destroyer is held to breaking point. She keeps that promise through the eradication of Tokyo, through helping with the injured in hospital, up until she finally decides she can’t keep quiet any longer when she’s held a screaming child. It’s a great character moment, one that makes sense, and Emiko pays a price for it in several ways. Not the least is that you can see that she continues to be bothered about breaking her word and the price that action has brought with it. Hideto Ogata is a ship captain and becomes Emiko’s love interest. He’s probably the least interesting character of the bunch, being a mostly standard hero, but that’s fine. He still gets his moments to shine, like his argument with Dr. Yamane about killing Godzilla, and his part in the build up to the finale. 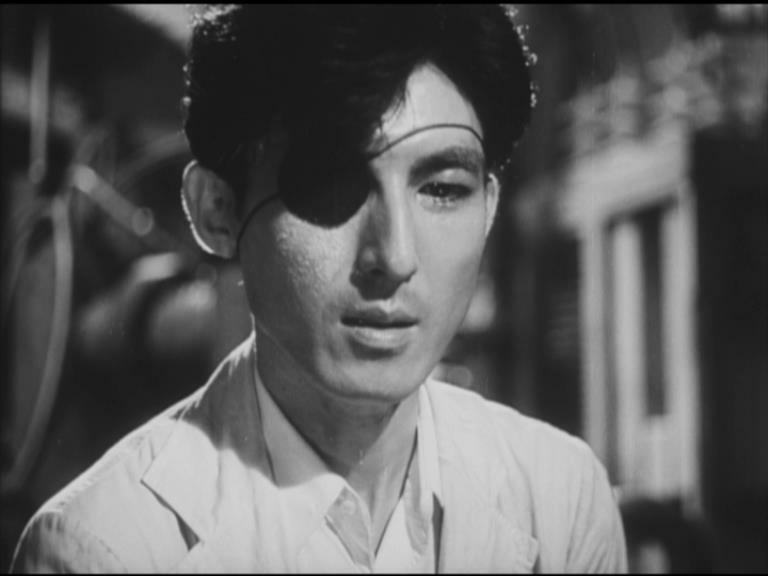 Poor old Daisuke Serizawa is a tragic figure. His research into oxygen has accidentally allowed him to come up with a hellishly destructive force, one that he can’t bear to see unleashed unless he can find some positive use for it. He’s aware that he has probably the only weapon that could stop the creature, but he doesn’t want to let the genie out of the bottle. By the time we get to the moment where he finally decides that he must use the Oxygen Destroyer to stop Godzilla, you can see it on his face – its use means he’s going to have to kill himself to make sure his work is never replicated. Serizawa is so sad, haunted, and resigned to his fate by the end of the scene. And then there’s Godzilla himself. He’s not interested in us. We’re little more than insects to him. He acts in a way that makes sense from an animal perspective, too. When ships wander into his territory, he destroys them as he would any potential threat. He doesn’t care about us one way or the other, we’re below his notice, but ships are bigger. He only hits Tokyo after the humans have tried using depth charges to kill him. It’s not an act of revenge – the charges have prompted him to move elsewhere because they were an annoyance. 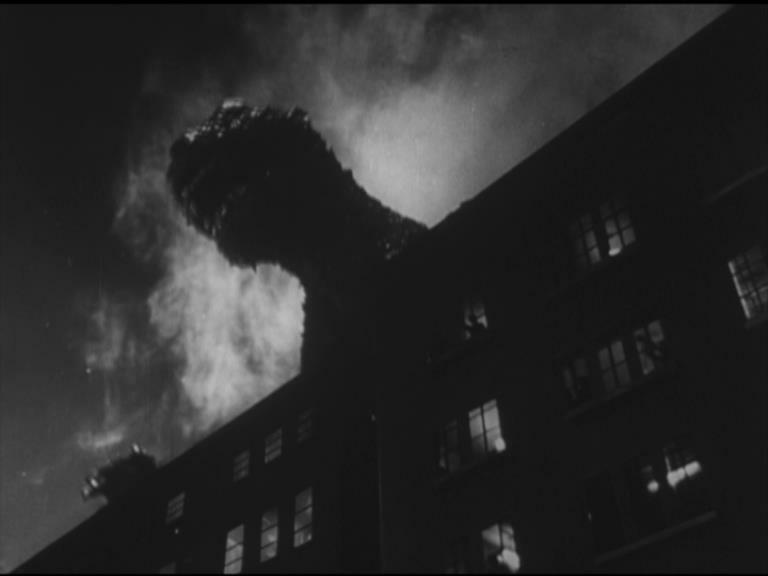 Another blink and you’ll miss it shot – the people panicking in the windows as Godzilla looms over their building. His first ‘attack’ on Tokyo is more Godzilla going for a bit of a walk in his new territory than anything. Godzilla is only destroying the things in his way, or the things that catch his attention or annoy him. None of it is wanton destruction for destruction’s sake, nor is it in anyway malicious. His second attack is more vicious and has more intent because the humans try to stop him. When he came up against the giant electricity pylons, we got his attention, and made him mad. As far as he’s concerned his home is anywhere he wants, and we were trying to keep him out of what he considered to be his territory. That’s the first time he breaks out the atomic breath, and the humans then make things worse be shelling him and firing rockets. From then on, anything is fair game as far as the big guy is concerned. And his demise at the end of the film is pathetic in the classic sense of the word. When the Oxygen Destroyer is unleashed there’s a real feeling of confusion from Godzilla – he knows he’s being killed by something he can’t see or fight. It’s truly sad. There are a lot of reasons why the original 1954 Godzilla is considered a classic. It’s a stark bleak look at our trying to cope with a terrible force of nature, and its themes and ideas are just as relevant today as they were when it was originally made. The characters feel real and their motivations and reactions make sense. It also shares that other trait of many great movies, that each time you see it you notice something different. If it’s been a while since you last saw it, go back and give it another look to celebrate the 60th anniversary of this amazing and enduring character. It’s certainly worthy one’s time and appreciation. 2. Compare this to some expensive modern films. Some announce their release date before they even have a script in place. They will even bring the writers on board and tell them that the movie has to have certain specific action scenes that have already been story-boarded and worked out. This approach may make for the occasional interesting action sequence, but it doesn’t lend itself to good writing or longevity. I doubt as many people will be watching Transformers 2 in 55 years time as are currently watching the original Godzilla. Writing not only matters when it comes to telling a story, it matters when it comes to continuing to make money decades later. 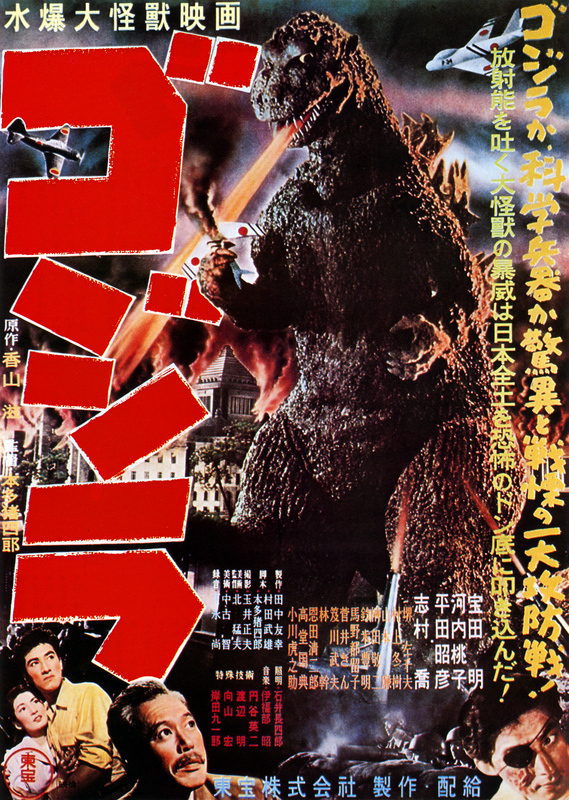 This entry was posted in Film/TV and tagged Godzilla, Godzilla (1954), Kaiju by dalekboy. Bookmark the permalink.